Reaching the Mutianyu section on your own is perhaps not as simple as get to Badaling, the most visited and crowded section of the Great Wall of China. However, if you follow these steps, you are not going to have any problem. For Spanish version click HERE. Take Line 2 of Beijing Subway and stop at the Dongzhimen station. Go out to the street by the “Exit B”. When you go outside, you will see the Dongzhimen bus station. Go into it. Follow the signs (it is very well signposted) and look for the platform of the 916快 bus. (You will pass through an arch with the number of this bus on the top). The price of this bus is 12 CNY and although the queue is long, there are buses every 5 minutes, so the wait is short. The bus ride takes about an hour and you have to reach the final stop, but before you arrive there, in the last stops, many charlatans will board the bus and will try to convince you to leave the bus right there. Our recommendation is that you get to the end. When you get off the bus you should hire one of the taxis (cars or vans) which will be there waiting to take you to the entrance of the Great Wall. A normal price would be about 60 CNY per car (one way) or 20 CNY per person. As always in China, you have to bargain with the driver. The taxi will drop you right at the ticket office where you have to buy the tickets of the Great Wall. You can choose between different ways of access with different prices: cable car, chair lift (with toboggan), etc. You also have the option to buy the ticket for the shuttle bus (15 CNY roundtrip), which is strongly recommended (next point). 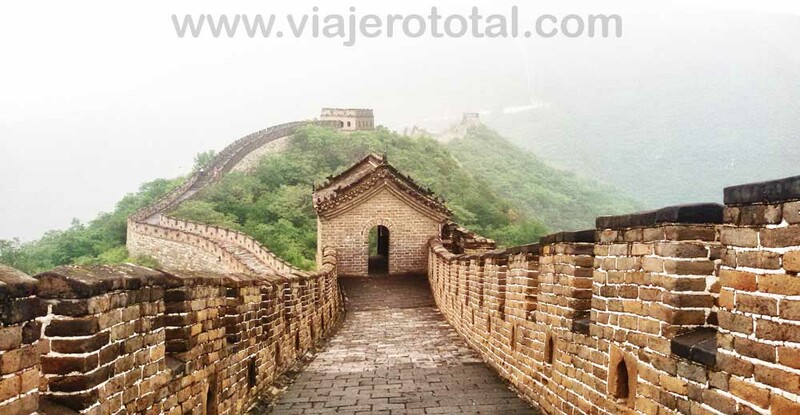 After buying the tickets, go through a shopping street full of shops and places to eat, like McDonalds or Subway, and you will arrive at the shuttle bus, which runs every few minutes, and after a journey of about 10 minutes, you will be at the foot of the Great Wall of China. Return, it is basically the same, but in reverse. When you come down from the Great Wall, you should take the shuttle bus at the same point than before and it take you back to the shopping street that we have mentioned in the former paragraph. Now you'll have to look for a taxi again to take you back to the bus stop where you had arrived a few hours earlier. Do not worry about it, in front of the ticket office there are always a lot of drivers waiting for you, and of course, you have to haggle. In short, it may seem complicated, but we assure you that it is not so, and when you do it, you will see that it was worth it. If you are interested to know more about Mutianyu, do not hesitate to read this other article. All our photos of Mutianyu section HERE.